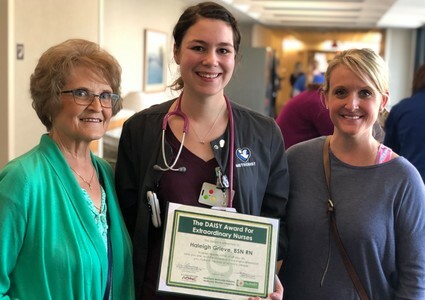 Following in her mother’s footsteps, Grieve became a nurse in December 2017 after graduating from Nebraska Methodist College. Her father, an army medic, also influenced her. 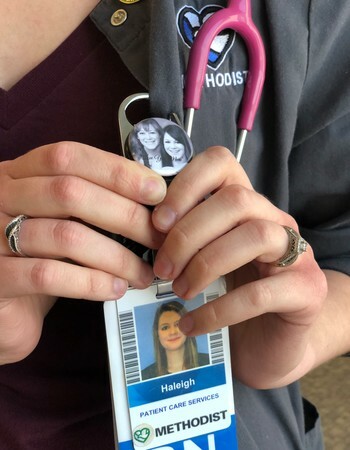 Her decision to pursue a career in nursing is something Heather Christy considers a blessing. “She was assigned to my mom’s room for a reason,” Heather said. Heather’s mother, Bette, was admitted for low blood pressure and a perforated colon. It was during her hospital stay that Heather witnessed Grieve’s kind, gentle and calming demeanor. “Even during the scariest point of Mom’s stay, she made everything OK,” Heather recalled. “The doctor came in and told her there was a possibility that she was going to need a colostomy bag,” Grieve explained. Heather became emotional when recalling how Grieve always took the time to explain things in a way that she, her mother and the rest of the family could understand. “That was just so important,” Heather said as she wiped her eyes. Equally important to Heather was making sure that Grieve was recognized for her efforts. 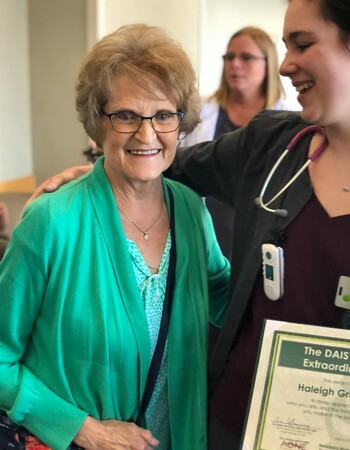 Following her mother’s stay, Heather nominated Grieve for the DAISY Award, which celebrates nurses for providing extraordinary care. But Bette knew she wanted to be there for Haleigh’s surprise recognition ceremony. When it comes to her skill and attention to detail, Grieve credits her own mother, who passed away in May 2017. And as for her kindness and compassion? Grieve always thinks back to the words her mother used to tell her.